Old East proper encompasses the area bound by Adelaide Street on the west and the CN and CP rail yards to the North, South and East. For real estate purposes the area south of Dundas, including the Western Fairgrounds ends up being a part of the Ealing neighbourhood and this zone ends up embracing area called Carling heights and for our purposes will be bound by Adelaide on the west, Highbury Avenue on the east, Oxford on the north and Dundas on the south. This area is notable as one of city’s oldest neighbourhoods. The area has been hit hard by the suburbanization of London. On the upside, there are a growing number of people who see great value in the area and recognize the historical value of many of the homes as well as the charm of many streets, for the Queen Anne and Cottage Style homes and they have been willing to invest in renovating and improving the homes in the area. It is home to Banting Museum. London East, unlike London North was not part of the Crown Reserve at the Forks of the Thames. It grew out of a swamp known as Priest’s Swamp, due to the close proximity of a priest’s house situated on its eastern boundary. The original boundaries of the 1810 survey of London East were set at the Thames River to the south, Oxford Street to the north, Adelaide Street on the west, and Highbury Avenue on the east. At the time, the largest land owner in the area was the Church of England (Diocese of Huron); and this land covered the area south of Dundas to Trafalgar, and east from Adelaide to Rectory. In 1857, this land was put up for sale, and by the 1880s all the land was sold. The history of London East begins in 1851 when Murray Anderson purchased a lot on the northeast corner of Adelaide andDundas. Anderson’s home was the first brick house in London East and the only brick house east of Burwell Street. Andersonalso gained fame as the first mayor of the newly incorporated City of London. Anderson was a dealer of tin ware, and he constructed a large iron foundry on the southwest corner of Adelaide and Dundas, now the site of London Police Headquarters. Anderson’s foundry, the Globe, gave rise to the London East community and initiated the area’s industrial history. The employees of the Globe, wanting to be close to work, built their homes close to the workplace. They bought inexpensive, small lots from land speculators. The London East of today is vastly different from the London East of yesterday, and the people of today will find little to indicate that it was once a busy industrial suburb. As important as the Globe foundry was, it was the oil industry which drove the rise in the prominence of London East. The first oil wells in North America were located in Lambton County in 1857. The refineries were located in Woodstock in Oxford County, but they were so far away, so in 1863 William Spencer and his partner, Herman Waterman, moved their entire operation to London East. The earliest refinery was built on the east side of Adelaide, south of the Great Western tracks and Bathurst Street, on the present site of the City Works Department. Business rapidly expanded and other refineries joined Spencer and Waterman. Among the more prominent were Duffield Bros. (Forest City Refinery), Stedwell & Co., L.C. Leonard, Burns & Co., and Bailey, Duffield and Co. The first use of the crude petroleum was lamp oil because little capital was required for the industry. Technological advances soon resulted in the smaller producers being pushed out, and in 1876 six of the larger companies formed the London Oil Refining Company. Each company continued to operate independently but all profits were pooled. The largest competitor to the London Oil Refining Company was Silver Star Works, built in 1870 by Englehart, Guggenheim & Co. The significance of American involvement in the oil industry is represented by the presence of Jacob L. Englehart, an Ohio native, and Isaac Guggenheim, a member of the famous entrepreneurial family from New York City. Eventually the oil refiners realized that in union lay strength, and largely due to William Spencer and Frederick A. Fitzgerald, “the rival groups combined forces on April 30, 1880, to carry on trade and business ‘under the name and firm of Imperial Oil Company’…”. The old Silver Star Refinery on Bathurst Street, became Imperial Oil’s sole London East refinery. The stability and prosperity of Imperial Oil was grievously halted on July 11, 1883, when lightning stuck the Imperial Oil refinery and the entire premises were destroyed by fire. Leery of further fires and inadequate fire protection the company rebuilt in Petrolia. The presence of the oil industry and supporting secondary industries established industry as the economic mainstay of the community and attracted a considerable population of factory workers. From 1856 until 1864, the population had grown to 500 people. By the time the community amalgamated with London proper, the population had risen to 2,000. Months of internal wrangling led up to the amalgamation of London East, due to anti-amalgamationists fearing extra taxes and loss of London East’s uniqueness. The amalgamation committee finally came to terms, and the amalgamation of London East and London was formally effected on August 20, 1885. With amalgamation, London East received water from the Springbank Waterworks, police and fire protection, street improvements, and the rebuilding of the G.T.R. Car Shops, which had been destroyed by fire on September 21, 1884. During the amalgamation, London banned all oil refineries because of heavy pollutants, and encouraged cleaner industries such as breweries and financial institutions. Until recent years, businesses stretched along Dundas Street, but a recognizable business district grew up on the corner of Adelaide and Dundas, known as Lilley’s Corners. Charles Lilley’s block of businesses appeared as early as 1864, and other businesses soon followed, including the Anderson Block, erected on the north side of Dundas by Murray Anderson. During 1970s and 80s London’s boundaries had considerably enlarged and, like other cities, it developed a suburban ring accompanied by several large shopping malls. These crippled the Old East commercial district on Dundas between Adelaide and Rectory (Centretown, as it was then called) and the area has never recovered. Most of the area’s storefronts have been sadly neglected in the past few decades, and many are in desperate need of repair. The neighbourhood is hopeful that a city-funded facade improvement program will help bring these lovely storefronts back from the brink. Sir Frederick G. Banting Square, adjacent to the Banting House National Historic Site, is highlighted by two features: a statue of Frederick Banting and the Flame of Hope. The life-size statue of this famous Canadian, was commissioned by the London & District Branch of the Canadian Diabetes Association in 1988. The statue depicts him at the approximate age of 30, shortly after the discovery of insulin, and is the focal point of Sir Frederick G. Banting Square. On July 7, 1989, Her Majesty Queen Elizabeth The Queen Mother kindled the Flame of Hope before 4,000 spectators. This symbol of hope burns for all those with diabetes that a cure will soon be found. It is also recognized as a tribute to Dr. Banting’s unrelenting pursuit of insulin; to the lives already lost to the disease; and to the continuing perseverance of those who live with diabetes today. While the Flame of Hope is a symbol of hope, it is also a reminder that insulin is only a control for diabetes, not a cure. Only when that cure is at last found, will the Flame of Hope be extinguished. Even though several buildings that made up the former Canadian Forces base have already been demolished, a small military presence in the form of Reserve and Cadet units will remain on a portion of the site, including “A” Block or Wolseley Hall, which houses the RCR Regimental Museum and Headquarters as it has been designated as a national historic site. Canadian Forces Base London (or Wolseley Barracks as it was more popularly known) was situated on land that had a long military connection. It was originally part of the John Carling farm. Carling, son of the famous brewer and one of Sir John A. Macdonald’s cabinet ministers, gave the Militia permission to use his farm for summer training camps beginning in the mid-1860s. In 1885 the Dominion government was seeking a new site for infantry school. Conservative supporters of Carling, especially Josiah Blackburn’s Free Press, suggested Carling’s farm as a logical choice for a permanent military base. However, the Liberal newspaper, The Advertiser, cried foul. Complicating matters was the fact the City was looking for a new site for the Western Fair Grounds (then just to the north of Victoria park), and Carling’s farm seemed to be the logical choice. It took a municipal referendum to settle the issue. The Western Fair Grounds went to its present location at Queen’s park along Dundas, and the military bought part of the farm from Carling. 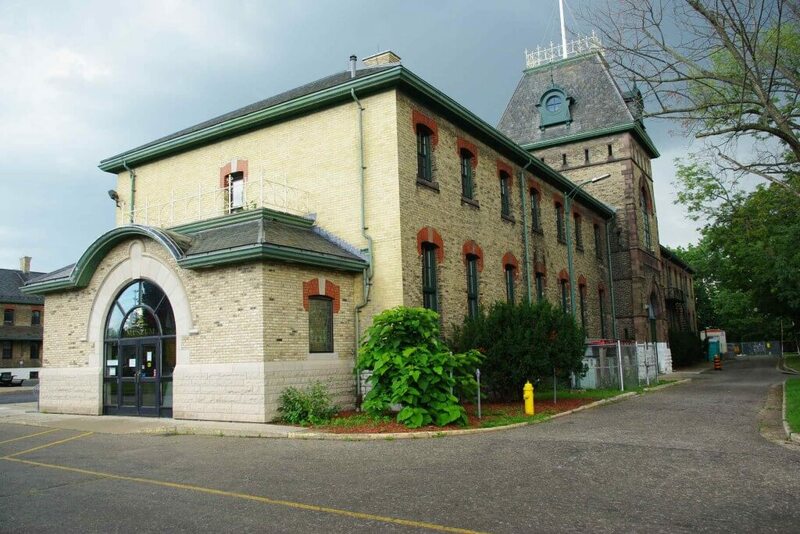 Wolseley Barracks, named for British Field Marshall Garnet Wolseley, has seen many changes over the past century. Tens of thousands of men and women were trained here during the First and Second World Wars in huge “tent cities.” Period photos of the base can be seen in the RCR Museum collection. If you want to catch a glimpse of London’s military past, take the time to drive through the base the next time that you are in the Carling Heights neighbourhood. 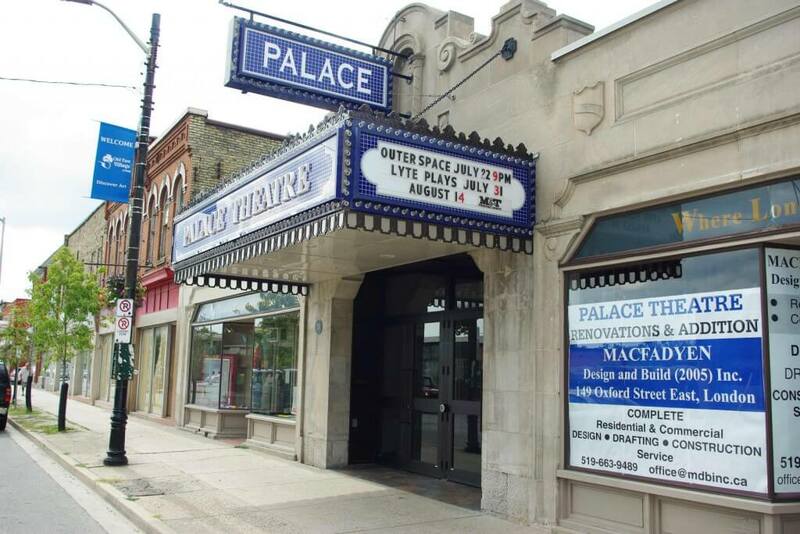 When it opened March 9, 1929, the Palace Theatre was hailed as “one of the finest and most complete establishments of its kind not only in London and Western Ontario but in the whole of Canada”. Besides boasting the latest in heating systems and projection equipment, the interior decorative elements were equally impressive. Similar to but not as opulent as another theatre of the same vintage, the Pantages in Toronto, the auditorium reflected neo-Classic detailing associated with the English Baroque period. The original proscenium (intact behind the new stage) is framed with a plain plaster molding and frieze decorated with rosettes, urns and acanthus leaves. On either side of this are semi-circular arched faux porticos with a “seating box” hidden behind a plaster lattice screen. The walls of the auditorium are capped with a prominent cornice with egg and dart and acanthus moldings. At intervals, there are Doric fluted pilasters with ram’s head capitals. The ceiling is patterned with another decorative molding featuring rosettes and wheat sheaves, framed in egg and dart. Six diamond shaped lozenges formed by the moldings framed tiered filigree metal and opaque glass chandeliers. The colour scheme was gold and brown. In the lobby, a drinking fountain as well as a storage room for baby carriages and bicycles were considered novel innovations. And in the upper ladies lounge, a glass panel was provided so that mothers with restless children did not have to miss the show! In 1990 the building was purchased by the London Community Players and underwent extensive renovations. The old cinema was reconditioned, with the addition of a stage and an orchestra pit (the latter partially funded by London Musical Theatre). In 1991 the City of London designated the front entrance and lobby of the Palace Theatre as a Heritage Property amid hopes that the new theatre with all its bustle and creativity might signal a rebirth of the “village” just east of Adelaide. The theatre reverts to its original name The Palace, and London Community Players reopens the theatre with a production of Allan Stratton’s play “Bingo.” The new theatre features 357 seats in 15 rows in fully air-conditioned building with accessibility for the handicapped. The Community Players sets for itself the mandate to provide community theatre in London; to provide a training ground for drama and theatre personnel; to develop and promote the application of drama and theatre in education; and to assist other dramatic and cultural groups in the community and area and to co-operate actively with other theatres and with regional, provincial, and national theatre groups. East Lions Park, Culver Park and Mildred Barrons Park, Bonaventure Park, a portion of Kiwanis Park, Admiral Park, Nelson Park, and Forest View Community Park. Elementary Schools include East Carling P.S., Blessed Sacrament Catholic Elementary, and Académie de la Tamise French First Language.